Well, it's official. 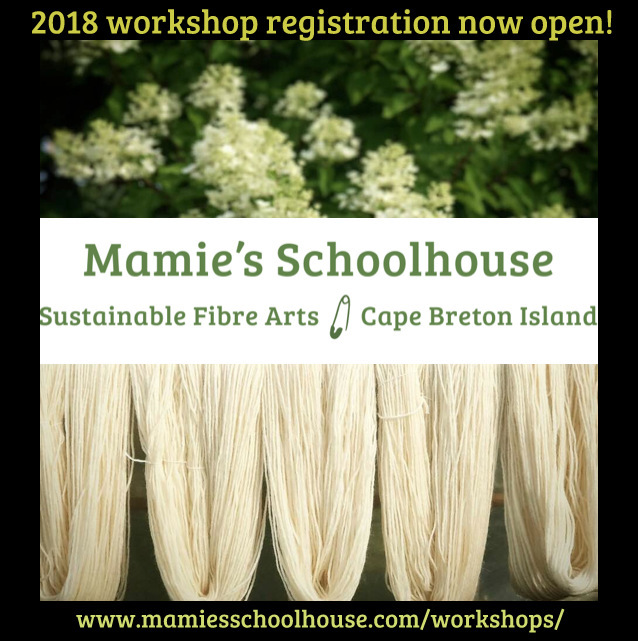 Mamie's Schoolhouse: Sustainable Fibre Arts on Cape Breton Island is up and running! Anyone who runs their own business knows that the work starts long before the formal launch of whatever it is the business offers - products, services or, as in my case, both - so that, much like an iceberg, the public only sees the tip, while the vast majority of blood, sweat and tears is invisible to all but the small business owner. Having said that, it sure is nice to be at the fun stage of helping other people build their natural dye skill set! I love teaching and keeping alive our ancient shared human heritage of glorious colour from plants by passing on what I have learned to others, while also helping students to work with natural materials in more contemporary, ecologically responsible ways. I have taught many workshops before, but my inaugural workshop under the auspices of my new business was a very successful 'Intro to Botanical Alchemy' session in Cape Breton's lovely little historic town, Baddeck, on May 6. I worked collaboratively with the Cape Breton Fibre Arts/CB WeaveNet folks on the planning for this first session, and the 14 students (the maximum I ever have in a workshop, in order to be able to give one on one attention) were a wonderful mix of novices to intermediate level natural dyers, fibre artists, historical re-enactors and others just fascinated (and let's face it, who isn't? :-) ) by plant dyes. I'm now in the marketing phase of my start-up and, while I understand how to do it, it's not what I'm most comfortable doing. I'd always rather be elbow deep in a dye vat, but small business owners have to wear many hats, so bring on the chapeaux! In betwixt the web site development, the marketing outreach, working with tourism organizations, getting my tax registration sorted, etc. etc. etc. I am finding some time to do actual fibre work! I really enjoyed creating a suite of yarns recently, dyed with my own organic plants and using Cape Breton wool from Rock Loaf Farm down on Isle Madame, for a local fibre arts store, and hope to do a lot more of this. I am involved with the Atlantic Canada Fibreshed, and am a passionate advocate for relocalizing natural fibre supply and value chains. The more local fibres I can source and use in my own fibre work, and in my workshops, the better for our island's somewhat battered economy, and the better for helping other islanders to succeed in their own sustainable fibre businesses. While my own teaching studio nears completion, I am teaching this Summer in an adorable former one room schoolhouse (clever, right? :-) ) just down the road. 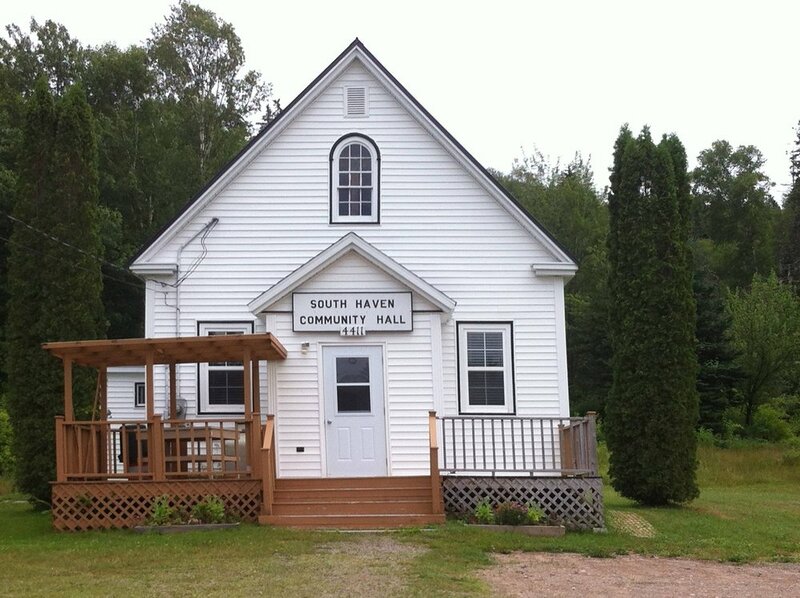 It's now the South Haven Community Hall and is in such a handy location - just 12 minutes from the beautiful, historic town of Baddeck, and just 1 minute from Exit 11 to the Gaelic College and the magnificent Cabot Trail. Next up at the Hall are two workshops later this month - Intro to Ecoprinting on Sunday 20 May, and (Ir)resistible Dyeing + Organic Indigo on Saturday 26 May. Both are also offered on other dates throughout the Summer, along with other workshop topics. All workshop registration information can be found here. Mamie' Schoolhouse is also listed on the Artisan Trail Map, put out by the Cape Breton Centre for Craft & Design. 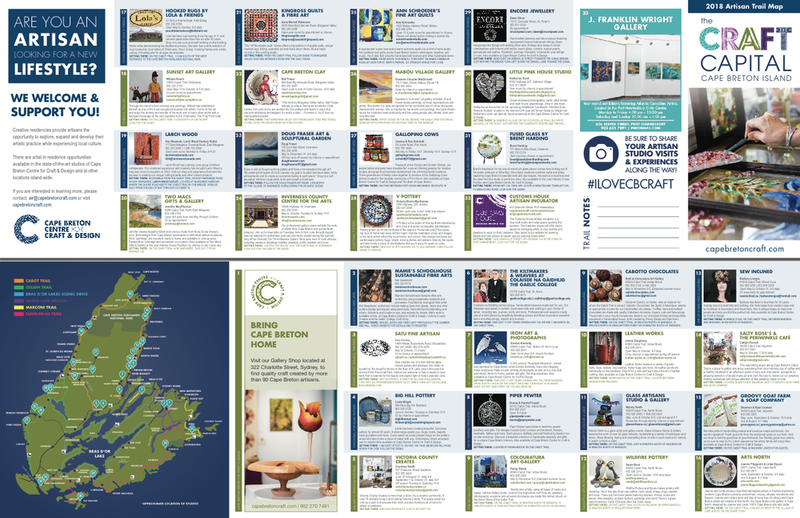 Whether you are local or a visitor to our stunning island, I hope you'll find the time to check out some of the many, many fantastically talented artisans who call Cape Breton Island home. I've also been busy working to build a Cape Breton Fibre Trial - kind of like The Artisan Trail Map, but intended for the keen fibre fans, many of whom travel the world to visit interesting fibre arts destination. Our island has amazing fibre traditions - stunning Mi'kmaq basketry, Acadian rughooking, Gaelic weaving - plus dozens of fabulous contemporary fibre artists working in every medium. I am determined to help put our island on the map (literally and figuratively) as a world class fibre arts destination, and will have some exciting news on that front a little ways down the road! Lastly, and really firstly, now that I'm at the launch stage, this is a good opportunity to thank some of the people who have helped me get this far - the Cape Breton friends who helped me launch my own fibre work through various galleries, the community of artisans in St Ann's Bay who are a never-ending source of practical been-there-done-that advice, as well as encouragement and good cheer, the galleries and stores that carry my fibre arts, my sisters Connie and Kathy whose encouragement and support means so much to me, and my wonderful friend Lorna, who is the best friend ever, and for whose unflagging support over the decades there are no words for thank you in the English language humble or grand enough. None of us achieves anything alone, and I am so thankful for all those who have helped me along the way.